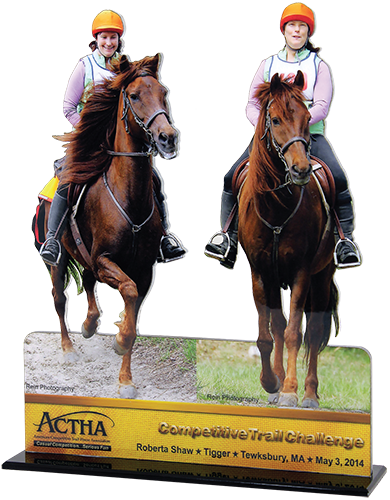 What You Need To Know: Our acrylic Cutouts are 3/16"-thick, custom made from your photos and cut to the shape of horse and rider (or other subject) in six standard sizes, from 4" x 6" to 20" x 30”. 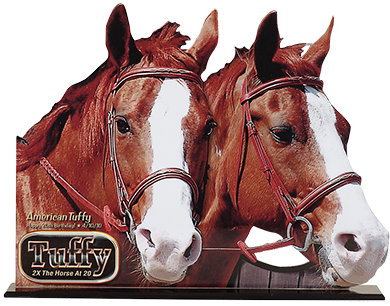 We typically place them on durable black bases, transforming images of your favorite equine buddies and events into fitting tributes ready for longtime mantle, shelf or desk display, but on request they can also be finished for wall mounting (contact us for further details). 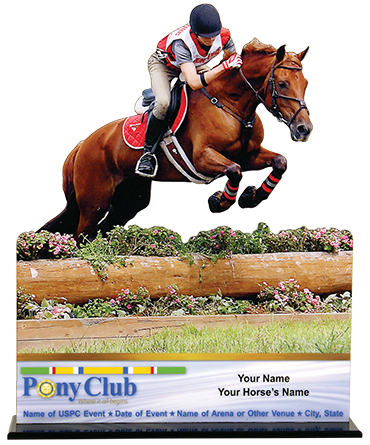 Newly lowered pricing is based on size, starting with up to 4" x 6" for just $22.95. Text can be added for $10 per line, or other graphics (logos, etc.) just $10 each. 9 Reasons Our Cutouts Are Better—Plus Easiest To Order: 1) Each Cutout is protected by a thick, high-gloss, premium-clarity laminate, shielding its surface from moisture, scratching and UV fading; 2) Our laser-cut paths are programmed by degreed commercial artists better able to follow "horizon lines" and visualize your finished product, enabling us to also automatically make more intricate and extensive cuts without additional charges; 3) Our laser-cut edges stay smooth and clean (unlike frayed and lifting edges that can occur over time when saw-cut); 4) Each print is mounted on a less-distracting clear acrylic (instead of the colored acrylics sometimes needed to conceal saw-cut scratches); 5) Our beveled bases are routed and polished for a finished look, with 25 sizes stocked so we’re better able to fit one to your picture; 6) Our beveled bases are also chemically welded for a very tight bond and clean-seam look (although we can also provide removable bases when needed); 7) You need only upload or email your photos to us (that's ALL you need do) and we’ll handle all image cropping/layout/design (you can request a PDF for review) plus we’ll automatically sharpen, color adjust, etc., your images; 8) Or send us a photo before ordering and we’ll gladly pre-check picture quality, etc. 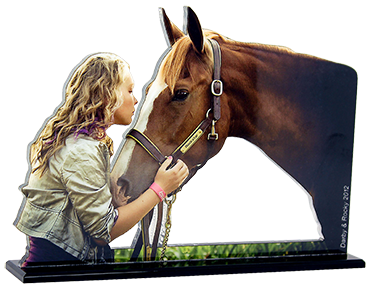 ; and 9) We can add text/logos/graphics, retouch your photo, combine pictures in the same Cutout, or even make yours 2-sided, for an extra fee. 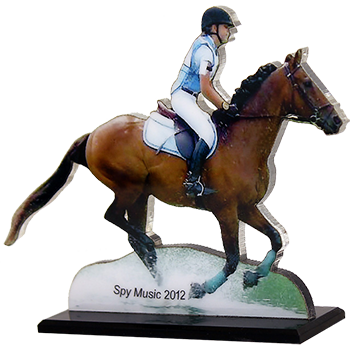 What We'd Also Like You To Know: "I love displaying my (11" x 14") 3D Cutout of Cappy and me in my office," a New York dressage award winner has told us. "When I need distraction, I can daydream myself right back into the ring because it's so vivid!" Some of the samples shown here were made from photos we also used to produce samples for our Popouts page and we're hoping this will help you differentiate between the two products. Also, keep in mind: when there's something in the background of a photo you wish wasn't there, a Cutout is an easy way to make that happen. 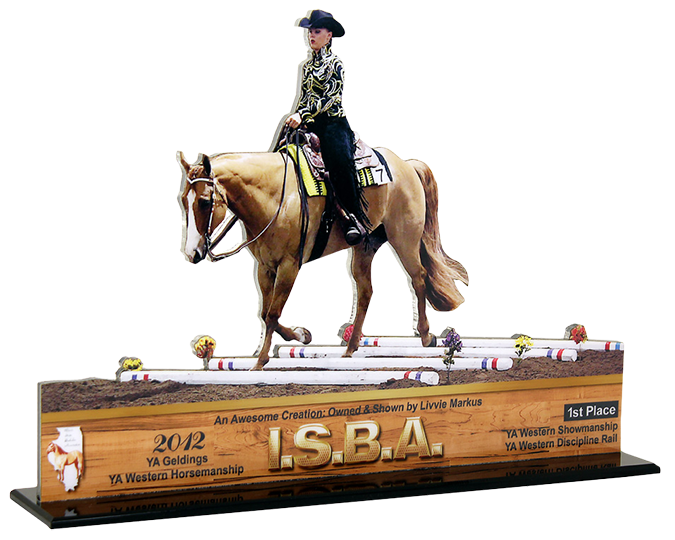 Our Group-Enhanced Cutouts and Award Cutouts, meantime, include specially designed panels with logos, other graphics and text, taking these products to a whole new eye-catching level, but you'll need to contact us via our Custom Quote page, by phone 1-877-N1-Horse (1-877-614-6773), or Contact Us, for pricing and additional info. 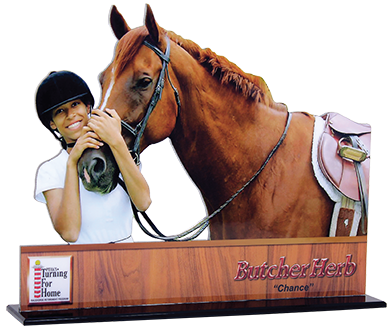 Our Group Cutouts, in particular, are an exceptionally good way to get a lot more for your money (with much more customization offered at little to no extra cost--click here to see the difference!) and your group simply needs to Contact Us ahead of time and arrange to have a totally FREE enhanced design created and made available online for you to order one. Once that's done, you can simply enter a group code in the box at the top of the page to take advantage of that enhanced design as well as all other group specials. Not sure your photo's good enough? Trying to decide between several pics? Or need some other assistance? Go to our Custom Quote page to upload any images you'd like us to review or if you have additional pre-order questions. 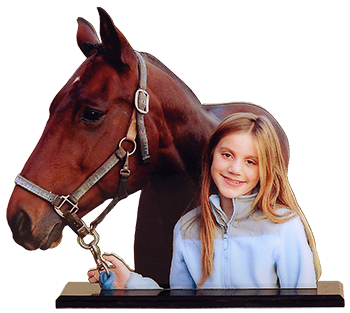 For more product info, you're welcome to call us at 1-877-N1-Horse (1-877-614-6773) or complete a Contact Us form and we will get back to you as soon as possible. 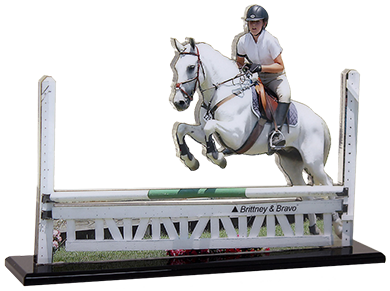 Your photos, by the way, can be of any subject you like (kids, pets, sports, cars, etc.) 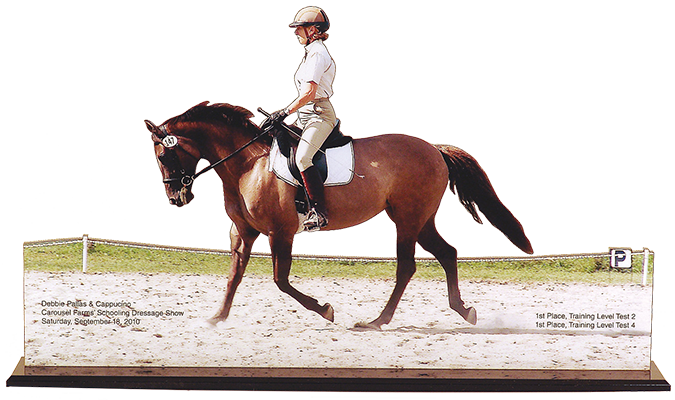 and do NOT have to be about horses.